Today at the Webheads hut in Edunation (Second Life), a group of us met up again. Kicking off first upstairs, lounging on the sofas and talking about our experiences in Second Life so far. 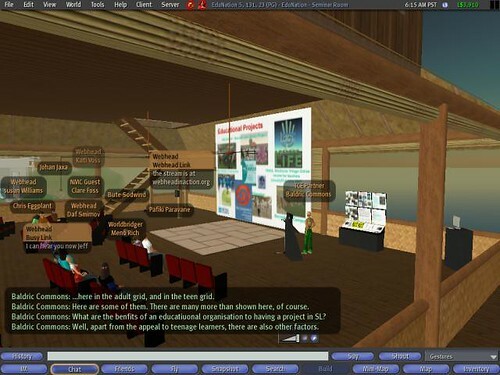 We then moved onto the Edunation seminar room, where Baldric gave a presentation on a proposal he's recently made for an island to be set up on the Second Life Teen Grid for 13-17 year old ESL learners. There were many useful comments from the audience of Webheads, (see the chat transcript)and we also had a subsequent discussion about the etiquette of asking questions, with us trying to work out the best ways of asking for the floor, rather than everyone chatting at the same time. Some ideas were proposed, but there is definitely a need for this to be discussed and rules of SL presentation etiquette (sletiquette?) developed. You need to save each screen as a jpg file and upload these image files, ordering them numerically or alphabetically. 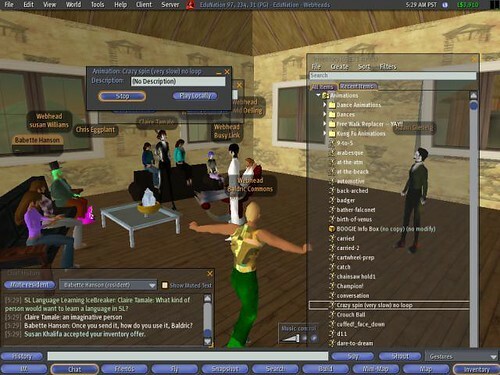 It costs 10L$ ro upload an image to Second Life, but then you can share it with anyone you want to. It's a good idea to use another tool, called a 'chat feeder' when giving this type of (text) presentation. This allows you to pre-load all the text in a notecard and simply click a button to display each line. We also tried out the Ventrilo Server, and the four or five of us who managed to get it to work started to get the hang of it during this session. Ventrilo has some issues, however: it seems that it is not available for Macs as of yet. You also have to be sure you set up the mic to be activated with a 'hot key' or it can cut out unexpectedly when you are talking. Other than that, I think those of us who managed to download it beforehand (Moira, Venny, Dave, Jeff, Mabel) and get the account details (ask Gavin or Graham, or one of the Webheads who have used the for)found it to be a successful way of holding voice conversations in SL. Skype is certainly easier to set up, but it tends to be a resource hog, particularly important to think about considering that SL itself needs a lot of your computer's resources. Subsequent discussion in the YG seems to point at the need to have some basic orientation sessions for people, to make it clear where and when sessions are going to be held (perhaps by having a noticeboard in the Webheads hut), and to work out better ways of getting people to and from various locations (so that nobody gets lost, and that we all arrive on time). Despite the difficulties, I think that most people enjoyed the experience, and are keen to continue exploring this fascinating virtual environment. Who's next to give a presentation?